Taiwanese food in general is as diverse as the island’s population. Over the last two centuries, immigrants from mainland China brought their regional cuisines to Taiwan and adapted to local ingredients. Combine this with dishes from the native island population plus Japanese culinary influence over a 50 year occupation and you end up with a country that knows knows food and demands quality. So you know a restaurant has to be really good to become famous in Taiwan. 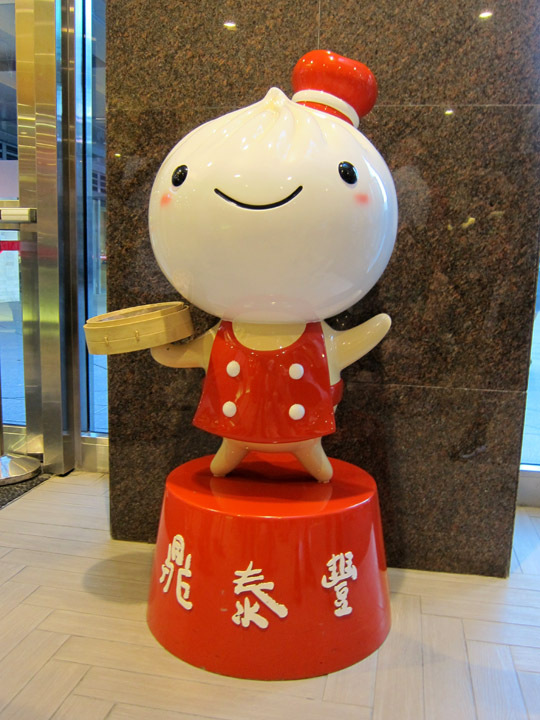 Din Tai Fung started off as a cooking oil shop in the 1970’s. Because of sagging business in the 1980’s, they converted half of the store into a little dumpling restaurant. The quality of the food soon spread by word of mouth and the restaurant expanded. Eventually additional locations were opened throughout Taipei, mainland China, Japan, Australia and even now in the US (Seattle & LA). 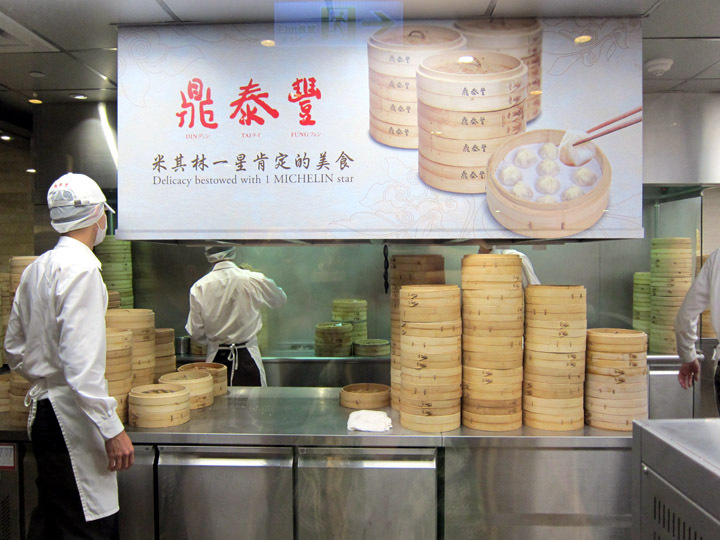 In 2010 Din Tai Fung earned a Michelin Star for the incredible quality of their cuisine which is head-lined by their Xiao Long Bao or soup dumplings. 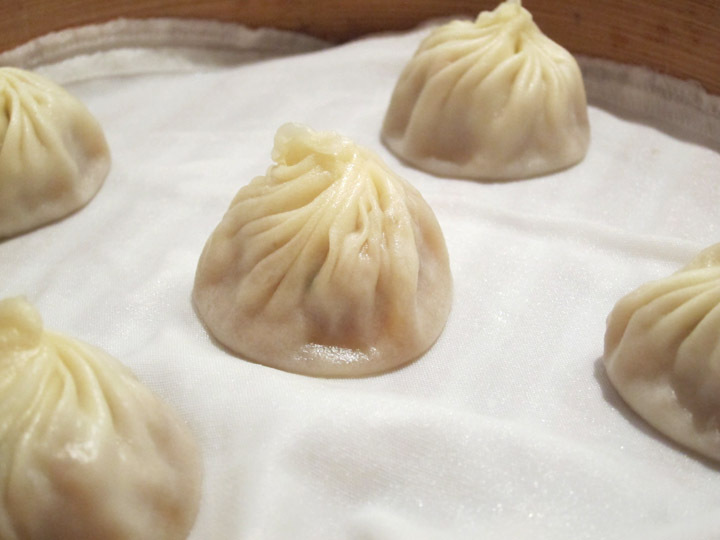 Xiao Long Bao are filled with a mixture of meat and vegetables. 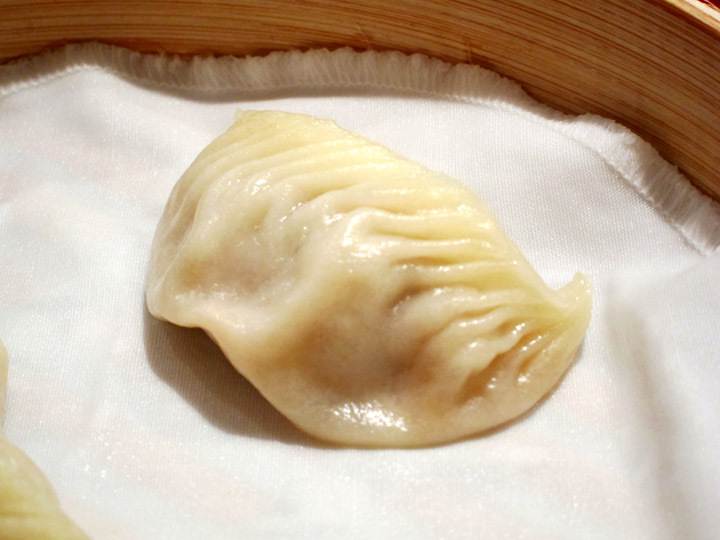 When steamed, juice is released and pools at the bottom of the dumpling. 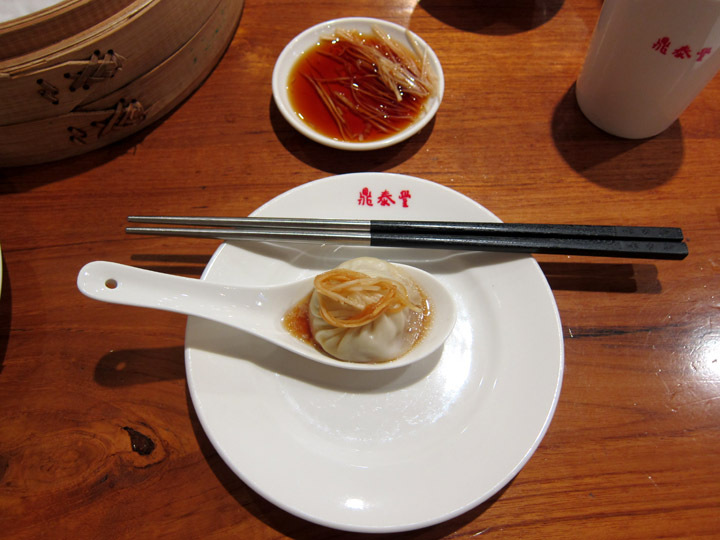 To eat a Xiao Long Bao “properly”, you need to soak ginger strips in a 3:1 mixture of vinegar and soy sauce. Filling your spoon with this, you add a dumpling and pierce the side so that the dumpling broth and sauce mix. You then eat that all at once for what turns out to be a fantastic flavor bomb! The tender wrapper, perfectly blended filling, and soup are just amazing. 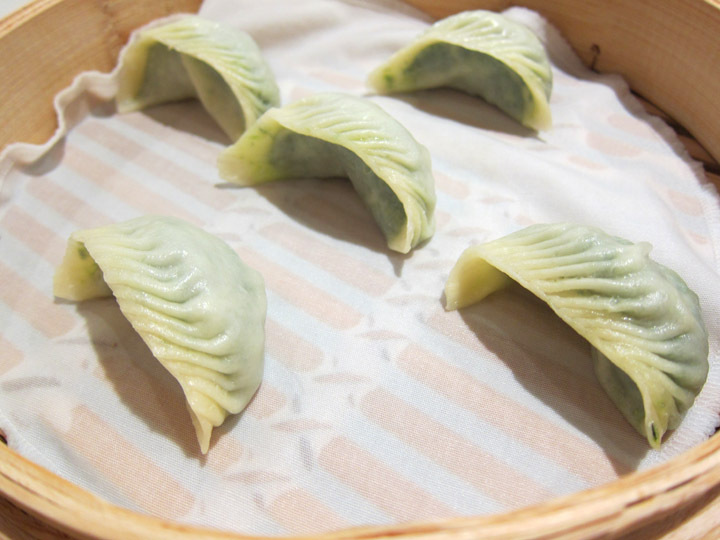 Green looking vegetable and pork dumplings. Each one is folded dozens of times by hand. Din Tai Fung also serves lots of other non-soup dumplings and steamed buns in addition to plates of sauteed vegetables, fried rice, and meat dishes. I definitely recommend the Taiwanese spinach with garlic! 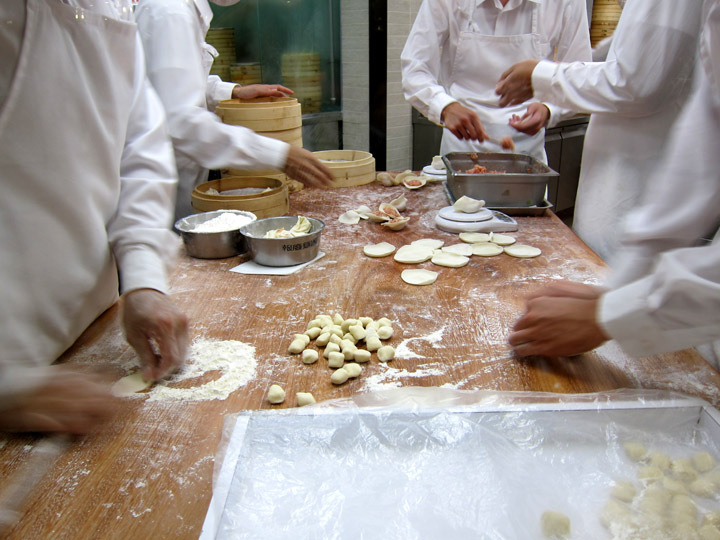 Super efficient chefs hand fill and fold thousands of dumplings a day at Din Tai Fung. All these little works of art are produced by a substantial and efficient kitchen which is thankfully behind glass so you can watch the flurry of activity. Teams of chefs flatten dough balls, fill to perfect specification, and then almost effortlessly seal the dumplings with tiny, elegant folds. The teams are incredibly fast and mesmerizing to watch. 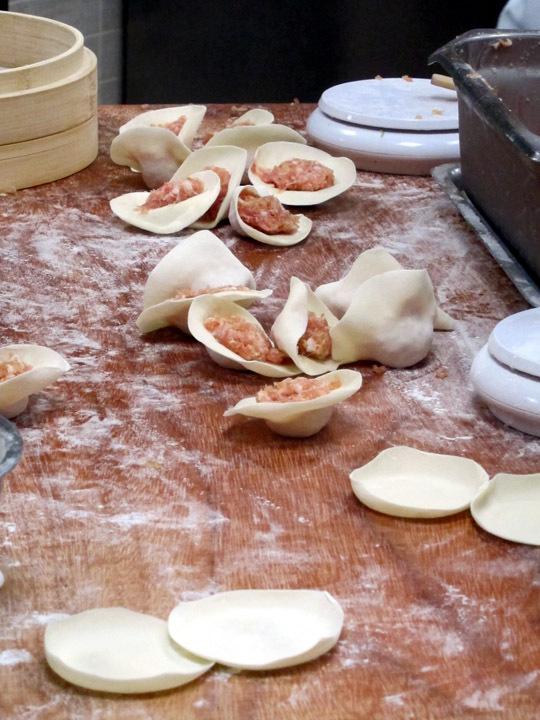 The open kitchen design reveals stacks of steaming buns and dumplings ready to go. It was great seeing all the effort that goes into these bite-sized wonders! As amazing as the food was, budget travelers and gourmands alike can enjoy Din Tai Fung because the prices were very reasonable. For dinner, I had a side of sauteed greens, several trays of dumplings, a soda and two sweet mini-buns all for $20. That’s probably the most reasonable Michelin Star meal in the world! Just don’t be put off by how lovely the little dumplings look; this is art that is definitely good enough to eat and there are plenty more in the kitchen.